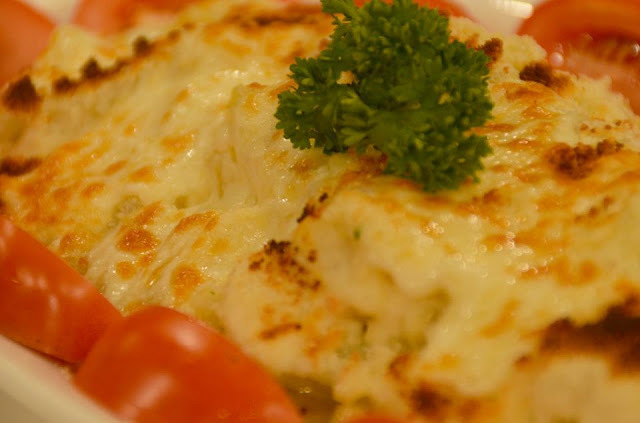 Family Buffets may involve grannies and grandpops who may already have to watch their food intakes, so Chef Boy thoughtfully includes Vegetable Gratin in his menu list. No sinful meats here but no compromise on taste and flavor either. 1. Blanch all vegetables in salted boiling water. Set aside. 2. Have ready ceramic dish. Brush with softened butter. Bed with béchamel sauce. 3. Put potato on first layer; zucchini, cauliflower and sautéed onion on second layer. 4. Cover top with béchamel, mozzarella cheese and parmesan cheese. 5. Bake in oven until golden brown or until done.